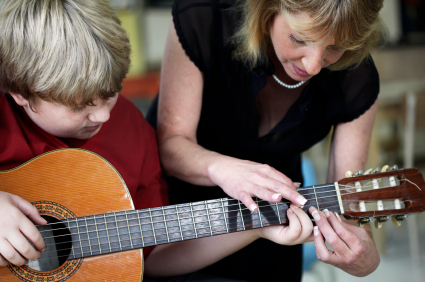 Ever consider using music lessons as a way to spend quality time with your kids? I’ve noticed parents who learn with their kids really have a great time. It’s a way to combine education and parental positive reinforcement. Both of you can take a lesson together (guitar works really well for this). For example, you can start by having young kids play a scaled down version of full chords while you challenge yourself with unmodified chords. Even if you haven’t played a musical instrument before, it’s not too late to start. How long should I practice? At a minimum of 15 minutes 3 times a week. unless the goal is just experiential. Thirty minutes daily would be in line with a more serious intent. In general, the more you practice the faster you progress. How long will I be taking lessons? A minimum of six months is needed to stimulate interest and determine aptitude for a specific instrument. 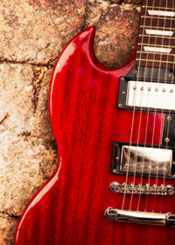 Musical aptitude varies widely, and mastery, of course, can take years. How many teachers should I study with? As one gains musical competence, it is sometimes useful to switch to a teacher who specializes in the style you are most interested in. Of course, it’s most important to choose a teacher who creates enthusiasm for music and mentors well. How often do students take lessons? Most commonly, once a week starting at 30 minutes. Will I need an instrument? Yes, students are responsible for renting or buying an instrument so they can practice in between lessons. I’ve been teaching guitar in Mountain View for 20 years.